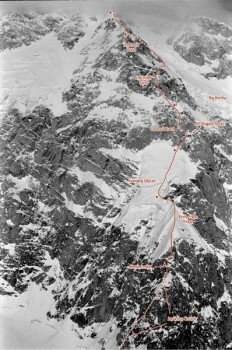 The Cassin is the quintessential technical climb of the Alaska Range. It is an elegant line that perfectly splits the enormous south face of the biggest mountain on the continent and is one of the most sought after climbs in the world. Many consider it a trade-route of the range, but judging by the actual number of ascents it has seen, it is still a modern testpiece and a lasting tribute to the visionary first ascensionists. The actual climbing is not that difficult by present technical standards. But the complete package of a long and dangerous approach, 8,000 feet of sustained climbing, high altitude, arctic cold and storms, and difficult retreat make this route a serious endeavor. The quality of the climbing is absolutely classic. Bradford Washburn wrote that the route had “unequivocally excellent climbing from start to finish.” Both the rock and the ice on this exceptional route are superb. Which SuperTopo guidebooks include a topo for Cassin Ridge?